Ensure optimal ventilation atop metal buildings, and protect rooftop piping and plumbing vents, with Metallic Products roof jacks. Our roof jacks are designed to suit specific roof slopes, and to create a firm seal you can trust. With a range of colors and finishes available, a Metallic Products roof jack gets the job done while blending in easily with its surroundings. The roof jack base is designed for final installation, with specified roof slope — either ridge or single slope, and either flat or mounted into the specified roof panel. Base and ventilating units come preassembled and ready for installation. 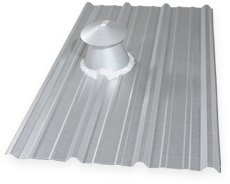 Single-slope bases mount directly into the roof panel, placed in such a way as to prevent damming. Straight side roof jack, mounted in flat base or customer panel with or without cap. Tapered roof jack, mounted in flat base or customer panel with or without cap.